Journey down the West Coast of Tasmania's wilderness (photo: Brook James). Strahan fishing village looks postcard-perfect across the placid early morning waters of Macquarie Harbour. We ignore it. We’re over at Strahan’s charmingly retro Regatta Point railway station (1899). We ignore that, too. 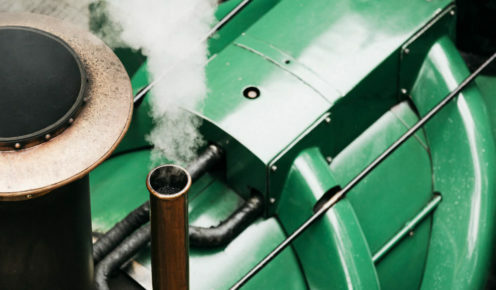 Instead, all eyes and iPhones are trained on a nondescript timber and tin shed, billowing steam. The doors open to a tooting blast of a whistle. Out rolls Mount Lyell Number One. Showtime! Spick, span and spry at 121 years young, Glasgow-built Mount Lyell Number One has everything you’d want in a vintage steam locomotive, except maybe a Thomas the Tank Engine face. 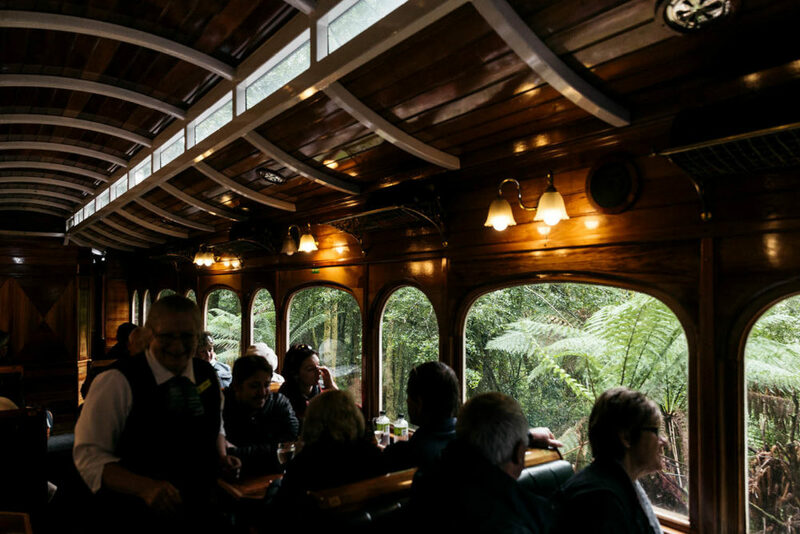 Its mission: to take us through deep, steep rainforest to Queenstown and back on the West Coast Wilderness Railway – just as it did for seven decades between 1896 and 1963, when this track was the lifeblood of a remote mining frontier. Today I’ve embarked on the Queenstown Explorer tour, one of three heritage steam train journeys offered by the West Coast Wilderness Railway. Then on to more pressing business. “I call myself the Evil Food Fairy,” she reveals, promising to stuff us to the gills as the day unfolds. 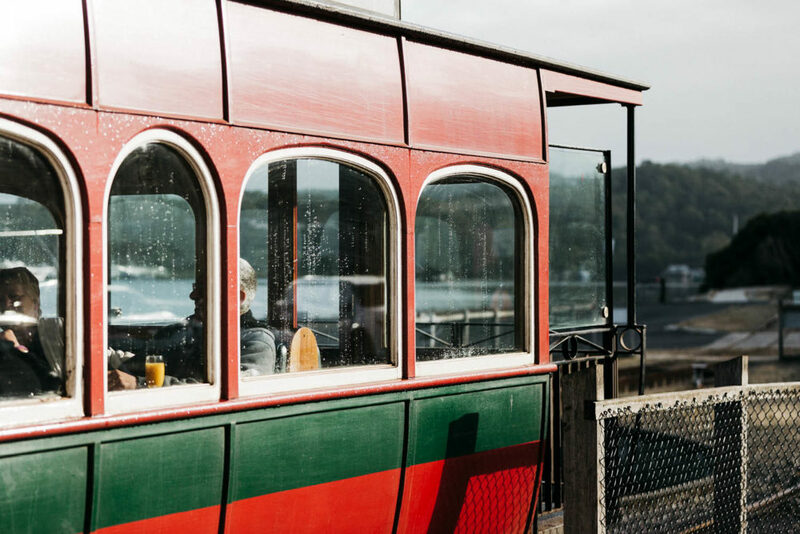 “You’ll be ready to roll off.” Fare enough – and all Tasmanian, too, from James Boag’s beer to salmon from Macquarie Harbour, which we’re skirting as soon as Number One gets rolling. 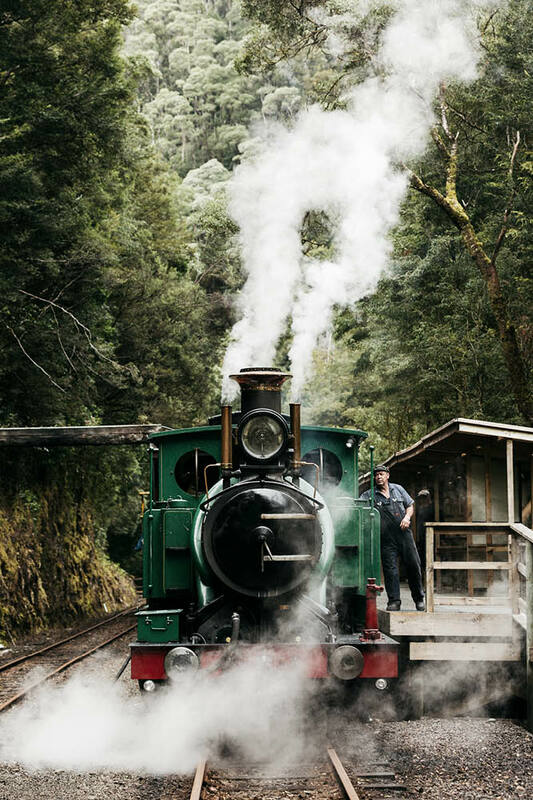 Apart from unique rainforest immersion, this is a day trip to the heart of West Coast heritage, on what has been claimed as the world’s steepest steam-operated railway. Back in 1891, mining magnate Bowes Kelly snapped up far-flung, failing Mount Lyell goldfield, sussing it was rich in copper. But how to get to market? With no road to Hobart (not until 1931) and only a dodgy cart track to the port of Strahan, he had to think big. 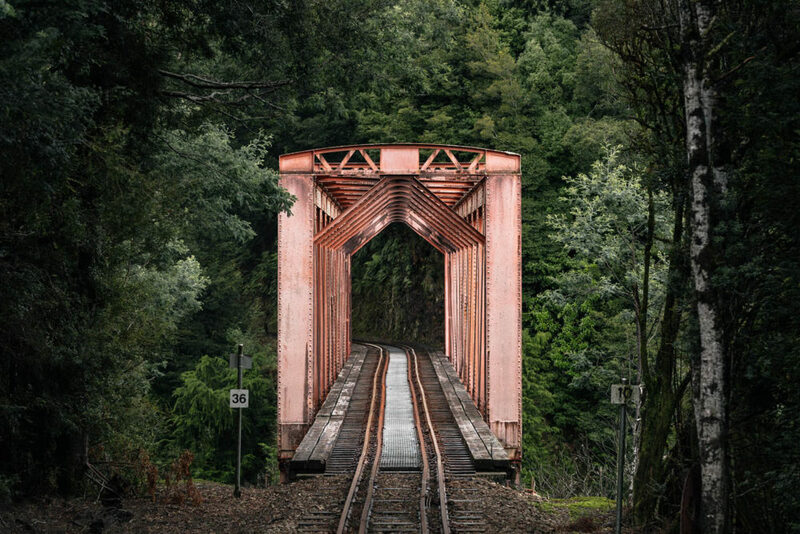 He also thought laterally – 35 kilometres across mountainous rainforest to the coast, by train. This meant laying track through some of Australia’s densest, dampest bush – and over inclines way too steep for any normal railway to manage. The solution was a rack-and-pinion track. This involves a third, toothed rail meshing with a double cogwheel under the locomotive to help haul uphill. 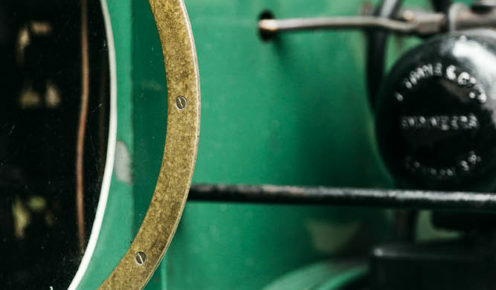 The cogwheels are offset, so there’s always teeth in the groove to prevent slippage. Called the Abt System (after its Swiss inventor, Roman Abt), it was an improvement over earlier rack rails (simpler and cheaper), and was first used in Germany in 1885. By December 1894, hundreds of hard-bitten labourers were hacking through wilderness, living rough in isolated, rain-sodden bush camps. Hand-hewn with pickaxe, shovel and wheelbarrow, the route reached Mount Lyell 19 months and 48 bridges later. July 1896 saw Number One’s maiden run to Queenstown, the newly named outpost servicing the mine. Teepookana was the original base camp, near today’s first stop, Lower Landing. Only the rusty ruins of a few iron huts remain, almost swallowed by ferns, but until Strahan was reached in 1899, this was the coastal terminus. Copper went by barge down the King River and Macquarie Harbour to Regatta Point, while supplies for Queenstown – groceries, coal, firewood – were loaded for the return journey. Bees are the only commercial cargo now; every summer the train takes hives into Teepookana State Forest to make Tasmania’s unique leatherwood honey. But that’s another story [see issue 76]. We’re deep amidst the leatherwoods now – and towering myrtles and huon pine, sassafras and ferns. Every hue of green colours this kingdom of tangled, mossy trees. Little bridges span plunging ravines. We pass narrow cuttings, like roofless tunnels. Debbie passes a delicious jam-and-cream scone, like an Evil Food Fairy. Our second stop, autocorrect-defying Dubbil Barril, is where the Abt rail begins, a double row of steel teeth bisecting the track lengthways. 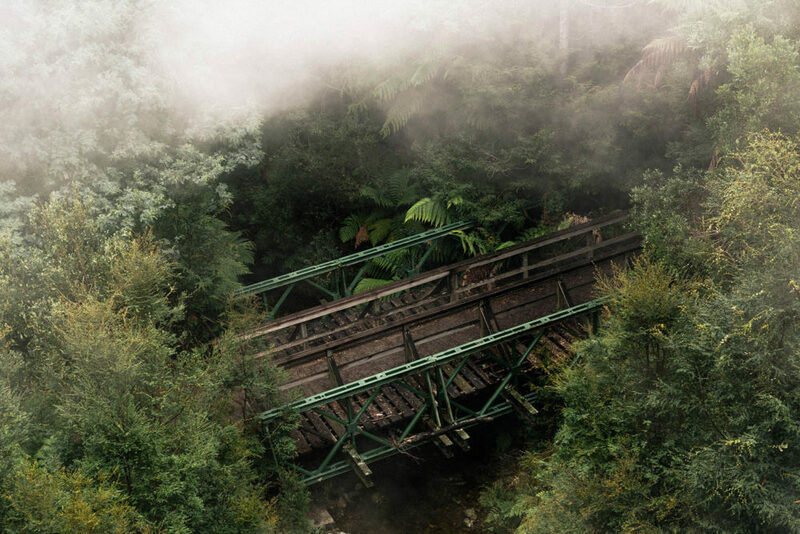 Number One’s steam breath segues into rainforest mist as we climb King River Gorge, a sweeping panorama of huge forested cliffs looming above dark waters. The loco ascends the steep grade with an ever-so-slight lurch, its chugging rhythm not so much ‘I think I can’ as ‘I know I can’. On the mountaintop, our third stop Rinadeena is, like the others, mainly for water. Number One drinks 10,000 litres every trip, but only carries 3000. Rainforest thins out as we descend into the Queen River valley. Soon we’re gliding into Queenstown (population 2000) for lunch at the modern station’s Tracks Cafe. Afterwards, a quick walking tour passes the grand old pubs you’d expect in a faded boom town. The mine shut three years ago; some doubt it will ever reopen. If not, a nascent reputation as an outback arts hub should ensure Queenstown won’t end up like Lynchford, our first stop on the return leg. Gold sparked a rush here in 1881 but precious little remains. 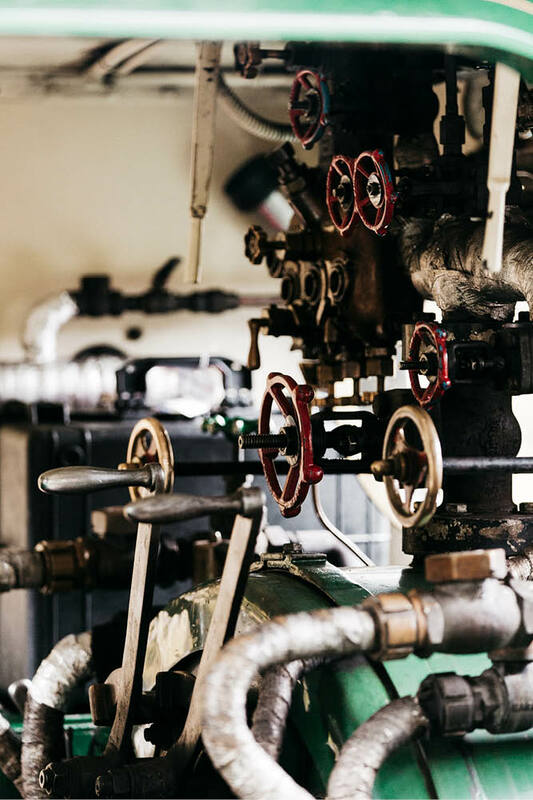 A forest clearing marks where a two-storey hotel once stood; a rebuilt store houses a museum; a gold-panning shed raises hopes of pay dirt while our thirsty engine fills its tank. When the original line closed in 1963, a way of life ended. 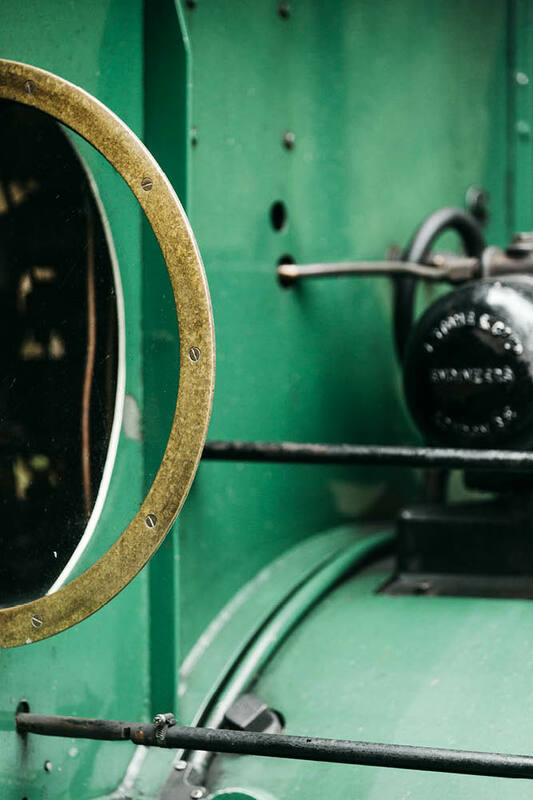 Everyone living alongside – dairy farmers, vegie growers, railway workers – moved on, and the whistles didn’t toot for another 40 years, when the first bid at rail tourism took off. The current venture – government-backed this time – resumed the full Strahan-Queenstown run in December 2014. 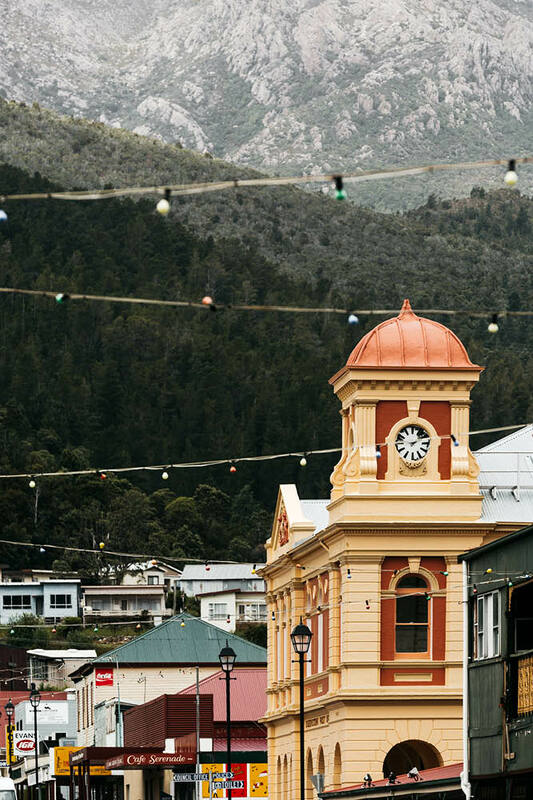 Just as Queenstown’s hills, blasted to bare rock by decades of toxic smelting fumes, are slowly re-greening, so too are the region’s fortunes flowering into new life. The West Coast is mining its rich lode of heritage these days, and it’s a rush that never has to end. Getting there: Drive from Hobart to Queenstown (260 kilometres) or Strahan (300 kilometres) – or from Launceston (distances almost identical). Strahan Village: Three to 4.5-star harbour-side accommodation. Play there: West Coast Wilderness Railway: There’s the half-day ‘Rack and Gorge’, which departs Queenstown and travels to Dubbil Barril; the half-day ‘River and Rainforest’, which makes a round trip from Strahan; and the full-day Queenstown Explorer, a round trip from Strahan with an additional tour of Queenstown. Strahan Gordon River cruises peep into pristine wilderness. Queenstown Iron Blow Lookout perches above the open cut of Mount Lyell’s original mine.